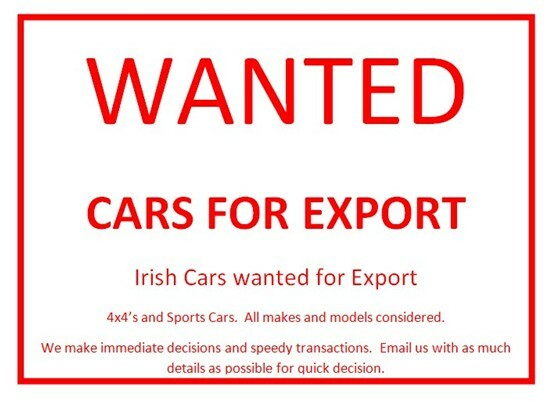 Dealer Direct Car Sales Ltd.
Irish Cars wanted for Export. 4×4′s and Sports Cars Wanted, Fast decisions and speedy transactions made. Do not trade your car, we will be able to offer you more, which should also result in you being able to purchase your new car for less (Car dealers love cash buyers with no trade ins)!! We are interested in Big Engine Cars, generally 3.0 litre and above. We are always interested in purchasing New Stock. If you want to sell your car, and are getting a bad offer for a trade in, lets see if we can do a deal. We will purchase your car from you, leaving you free to go shopping without a trade in. You will find you'll get much better value. We are always happy to make contact with Car Traders in the UK and Ireland. If we dont do business already, feel free to contact us, and we may be interested in purchasing or help supplying your stock. Generally we purchase small engine vehicles in UK for Irish Markets, and Larger engine vehicles in Ireland for UK markets. Copyright © 2014 Dealer Direct Car Sales Ltd.